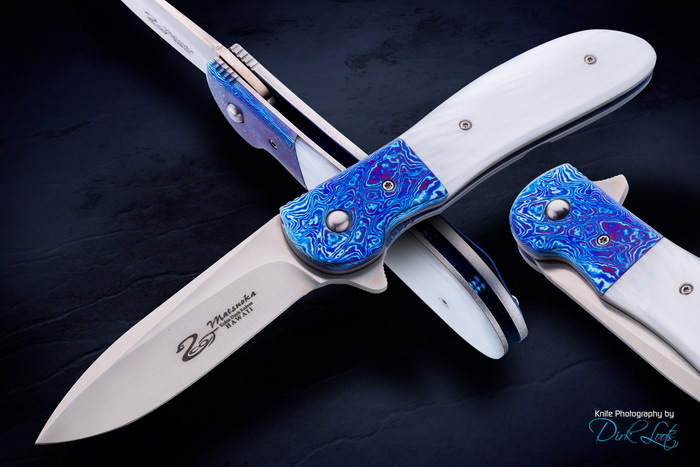 This Kala Framelock Flipper by Scot Matsuoka features a satin finished Crucible CPM 154 powder metallurgy high carbon stainless steel drop point blade with false top edge. The Titanium frame has a colorful Krinite and Timascus front scale. Satin finished 3.5-inch drop point hollow ground blade with flipper and smooth IKBS action. It has an anodized, right hand, tip down titanium pocket clip. Comes with a signature Scot Matsuoka zippered knife pouch. I grew up in Koloa, on the Garden Island of Kauai. My logo is my first name, Scot, with a backward “S” shaped like a duck. The idea for the logo emerged because there is an endangered species called the “Koloa Duck” so, in thinking of a logo, I wanted to go back to my roots since I’ve been interested in knife making from an early age. The first knife I made was at the age of about 9 years old. I started making knives out of large nails that I found around the neighborhood. I would pound the nail flat on a piece of railroad track that my dad used as an anvil. Then I grounded the blade using my dad’s grinder. The finished product resembled a knife but wasn’t able to cut anything. In 1990, I bought my first knife magazine and started making kit knives. I met Hawaii knife maker Ken Onion at the 1993 Las Vegas Classic Knife Show and asked if he could teach me how to make knives. Upon returning home to Hawaii, I visited Ken at his home and Ken began teaching me the basics. I made a few beginner knives and then quit because it became too difficult and frustrating for me to learn. Then in January 2003, after attending the Las Vegas Classic Knife Show, it rekindled my interest in knife making and I began visiting Ken Onion on a regular basis. With Ken’s help and my determination, I perfected my skills with the grinder making fixed blades. In September 2003, I attended my first gun show in Honolulu selling fixed blades. There I was able to meet other knife makers from Hawaii and share thoughts and ideas. In October 2003, I started making folders with Ken Onion’s guidance. You’ll notice a similarity in the blade style of my first folders compared to Ken’s folders but I am slowly breaking away into a style of my own. In January 2004, I attended my first Las Vegas Classic Knife Show selling fixed blades and folders. I had a lot of fun, and was able to show my knives, get my name out, and make friends and contacts. After returning to Honolulu, I began receiving orders through email from people who saw my knives at the LVCKS. A picture of my most popular knife, the pahinui, made it onto a knife forum. I am a part-time knife maker whose goal in life is to, one day, make knives on a full-time basis. Pictures of my knives have appeared in Tactical Knives Magazine, the Knife Annual, and on the cover of the April 2006 issue of Blade Magazine.